Milan just gets stronger as its cast of stylish characters keeps getting more diverse and extravagant. Oh dear…all those nay saying so called stylish fashion snobs…put a smile on my face….who says bad taste is bad taste and good taste is good taste…all those wonderful fashion critics that flock to The Sartorialist…a little lesson from Mercedes da Acosta who she once said it so very well…” You should wear clothes for giggles,never take them seriously,because if you do,you will capitulate to convention “..
OK, so everything is style, if nobody can say that an outfit is not stylish, what bother talking about style or fashion ? I agree, but I also feel that people like this are actually making fun of the fashionista’s and their so called expertise. LONGSTROKE…you’re right on the money! He’s the same chap of September 27th…boy does he seem to have fun being his wonderful self…he creates his own looks…make the whole fashion circus look lame! i like his look for some reason! it definitely works for him. Its hard to keep the faith when the guy is dressed like a wealthy hobo. Maybe if he was actually wearing pants, this would be amazing. But this is…..OMG. I personally think this has nothing to with style. Call it exhibitionism, bad taste, a far echo of some personal troubles. Call it the way you want. Do not call it style, please. 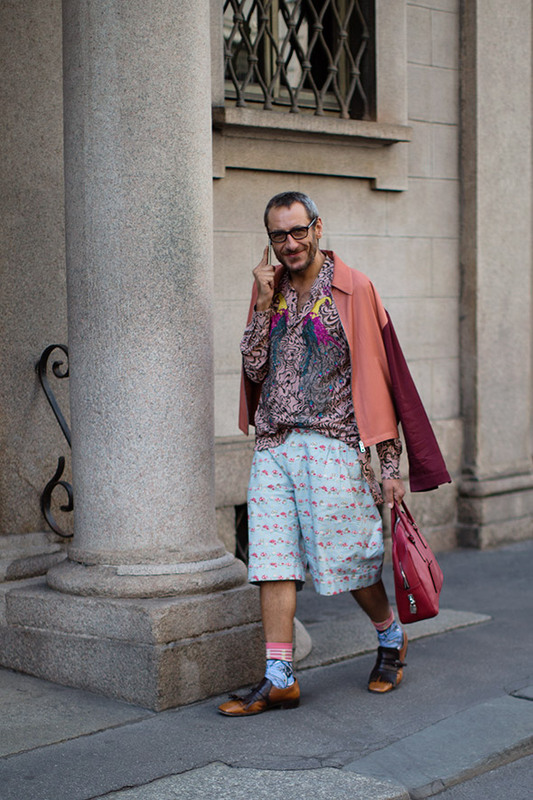 I totally agree – this is certainly not ‘style’ in the recognised sense at all and there is definitely nothing sartorial about this mish mash of clothing – but it does make you smile to see this crazy man in his PJ bottoms. Could anyone not want to capture this explosion of colour and pattern? I do love that shirt. Well, it certainly is different! Again this mysterious and flamboyant character. I am really wondering who he is. His style is not my cup of tea but he pulls off this outfit with such a positive attitude that I don’t mind. It feels like it’s just him, he is not forcing himself or something. Plus it’s the second time he puts a smile on my face, so I just love him. Hooray-the man with the leopard skin coat returns. And it appears he has a collection of wild socks! Perhaps if you asked nicely, he would display his entire closet! His outfits are enhanced by that wonderful smile. I bet if I ask him for his shoes, he’d give them to me. Looks more homeless, than stylish. I want this outfit from head to toe! @ Emmanuelle: the guy is called Emiliano, he’s the other half of a couple of quite successful architects under the name od Dimorestudio, in Milan. They have a rather sophisticated taste in interior design, not percolating, alas, to his own style choices. Consistency can be a narrow pigeonhole sometimes. Love his bag! So classy! Love how happy he looks here, great shot! Is that a 3/4th or just a shorts. looks cool by the way..
Looks like he slept in the laundry pile, awoke and got dressed in the dark. Extravagant of Cabinet of curiosities? Me too. I think he is the best ever. This fuggin’ guy. Not again. Ha. It’s that guy in the frock again! My is he stylish! I love his grin. Who is he does anybody know? He is literally laughing at all of “the media” who is taking the time to write about his “style” and of course at all of us who are reading this article. ty. I had an uncle that dressed like that. He was always smiling too. I love his look and I’d wear it but probably without as much style as he manages. Also, my ensemble would probably or most definitely come from The Goodwill or similar venue. My take: This confident man appears to be happy living his creative life! He doesn’t need approval or want attention. He just enjoys mixing things up and being his own non-trendy, comfortable self. What a treat to see him on the street; a work of art walking. Yes, he wants attention!! I think he’s promoting his brand in a happy, flamboyant way. Now I know his name and that he is a designer. Better than a sandwich board, you have to admit. If it works, it works. It works for him, so let it be. Just because you can, does not mean you should…awful. This is style! His, not mine, but I love it. I’ll take style over aspirational fashion and social class anxiety anytime. Such as positive energy. Unique and amazing! I like his smile, and happiness, that’s it. But the above comments are a riot!!! I love the one just above, reminds her of when grandpa walked out of the house in his shorts, OMG, funny! In NYC, we love friends like this but tell them to their face, you’re a hot mess! There he is again. Gotta like those clothing combinations! Styling Takeaway: Tone down a pair of oversized jeans with a simple white button-down and classic black pumps. You only need two pieces for the ultimate effortless fall outfit: an oversize turtleneck sweater dress and over-the-knee boots—throw them on and go. Speechless. Once again, this is awful. It’s how I envision Tyler the Creator to look when he ages. I appreciate it for what it is though. I want to marry him. Personal style is just that… personal. His look screams confidence. Good for him and everyone else that dresses to please themselves. I hate this, but he is totally pulling it off.